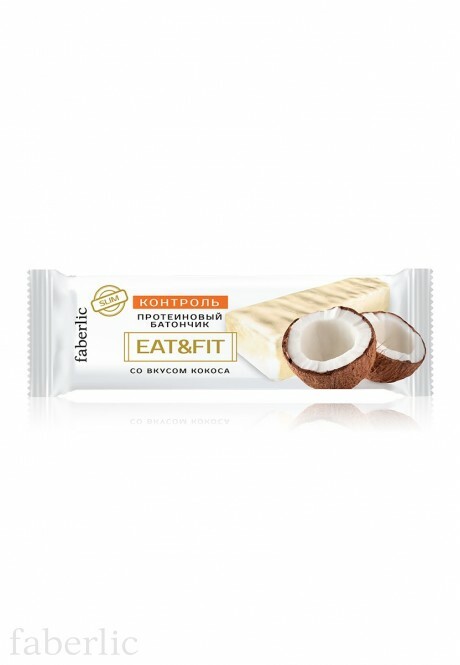 Contains: glucose syrup solution, coconut flakes, white confectionary coating (lauric cocoa butter substitute, sugar, maltodextrin, dry milk whey, flavoring agents, emulsifiers (soy lecithin, polyglycerol and ricin ethers)), dry cheese whey, sugar, soy protein isolate, water, whey protein concentrate, milk protein concentrate, maltodextrin, water-retaining agent glycerin, hydrolyzed collagen, flavoring agent, vitamin premix (Vitamin C, niacin, Vitamin E, pantothenic acid, Vitamin В6, Vitamin В1, Vitamin В2, folic acid, biotin, Vitamin В12), Vitamin С, preserving agent - potassium sorbate. Nutrition value (35 g): protein – 5.5 g, fat – 4 g, carbohydrates – 17.2 g, dietary fibers – 2 g.
Caloric value – 133 kcal / 557 kJ. Vitamin content (35 g): Vitamin C – 23 mg (38% of recommended daily intake), niacin – 1.7 mg (9% of recommended daily intake), Vitamin E – 1.4 mg (14% оf recommended daily intake), pantothenic acid – 1.1 mg (18% of recommended daily intake), Vitamin В6 – 0.25 mg (12,5% of recommended daily intake), Vitamin В1 – 0.19 mg (13,5% of recommended daily intake), Vitamin B2 – 0.18 mg (11% of recommended daily intake), folic acid – 38 mkg (19% of recommended daily intake), biotin – 14.4 mkg (29% of recommended daily intake), Vitamin В12 – 0.11 mkg (11% of recommended daily intake).